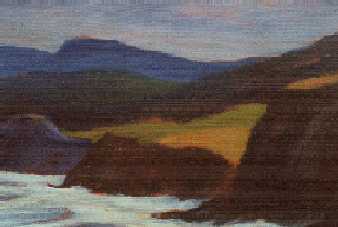 At right, Around Cape North was painted in Cape Breton, N.S. in 1997. The oil painting at left, Nantucket Harbor, measures 20" x 36" and was painted in 1997. Other Nantucket landscapes and seascapes are available. The two oil paintings below were inspired by morning sun on the town of Nantucket as seen from Monomoy. The one at the left is 8 X 10 inches. The one on the right is 2 X 3 feet in size.